Our approach of extending rather than replacing Excel allows us to leverage the world's best understood charting engine - Excel charts can be designed in Excel and published to XLCubed Web and give a high degree of formatting control. 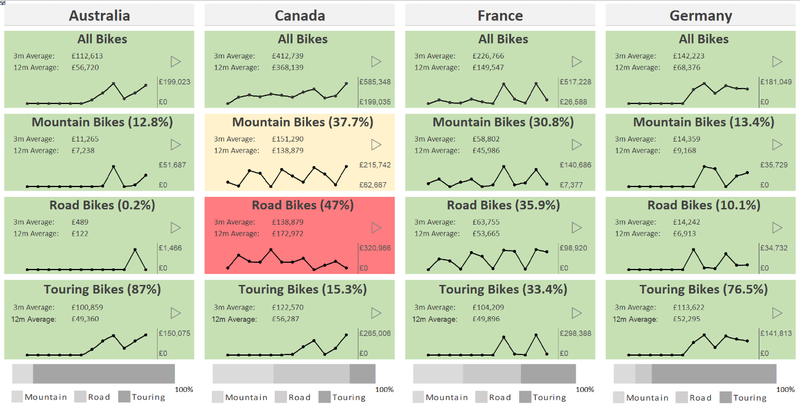 But don't stop there: we have also added a number of charting and visualisation components to address gaps in native Excel. A wide range of chart types that display within a single cell. In-cell charts display within an individual Excel cell, and can be highly effective as part of a data table to show historical context, show relative volumes, actual to target, distribution or to flag issues. Easy to use and highly configurable they are a great addition to business reporting which require very little screen real estate. A tile based visualisation representing values by colour and size. TreeMaps represent hierarchical data as a set of nested rectangles (tiles) where the area of the tile represents one metric and the colour a second metric. They can be a highly effective way to visualise regional sales where for example States may be the outer tile, and Cities would be nested tiles within the State. Colour is often used to identify an issue in the data, for example red may signify negative margin. Repeat one design across several members. The Repeater control extends the concept of a small multiple chart - where it is very easy to quickly build several charts varying by just one element - to any part of a report, not just one chart or one grid. 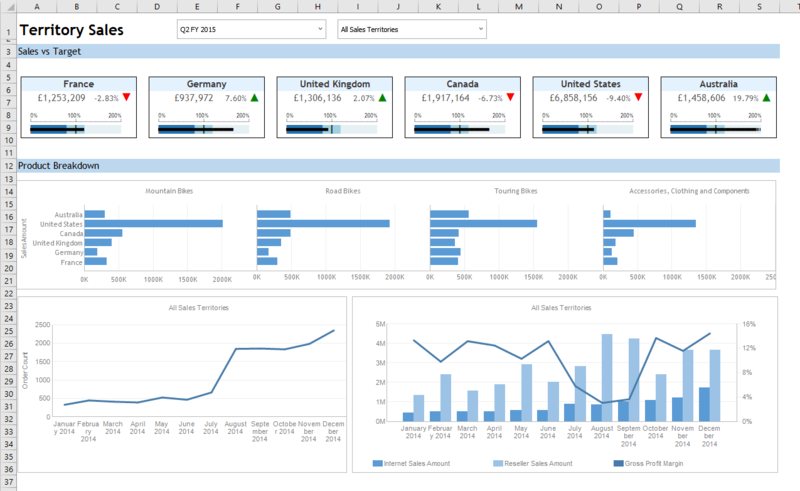 It lends itself really well to card based reporting where a summary view is defined, potentially combining XLCubed and native Excel functionality, along with charts. Having built the base layout as required, (for a specific location, for example) the process of extending that across other locations, and displaying them together in a consolidated view becomes extremely quick and straightforward. Display several charts in a drillable grid. 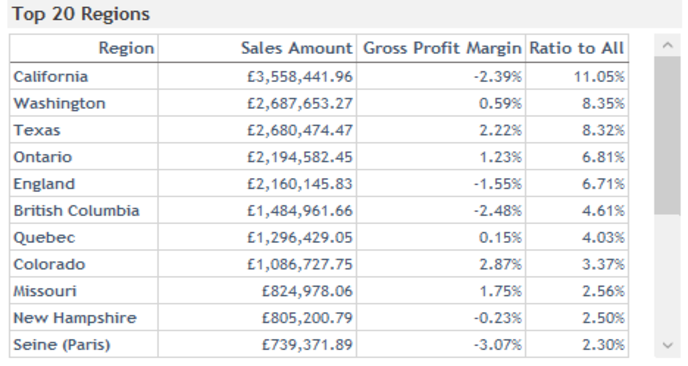 Also known as Trellis charts, Small Multiples connect directly to the data source and are highly interactive. They are used to display multiple charts varying by one selection criteria on the same chart framework, for example each chart displaying sales for a different product across the same time period. They can be used to quickly configure a pre-determined view of the data, or for interactive data discovery through chart driven drilldown. Interactive point and shape based geospatial mapping. XLCubed provides both point and shape based geospatial mapping. Maps are interactive and can be zoomed and panned as required, can be configured to display additional information on hover over, and used as selectors for other areas of the report. Firstly, handling row dynamic elements within a formatted report, particularly where there is other content below the variable length section. Secondly, columns can only be one width for the whole worksheet, which can lead to layout challenges with different sections of the report. Viewports adress both issues by providing a dynamic, scrollable window to another part of the workbook, allowing users to display any data in the workbok anywhere, free from the row and column boundaries. All the features and formatting capabilities of Excel. 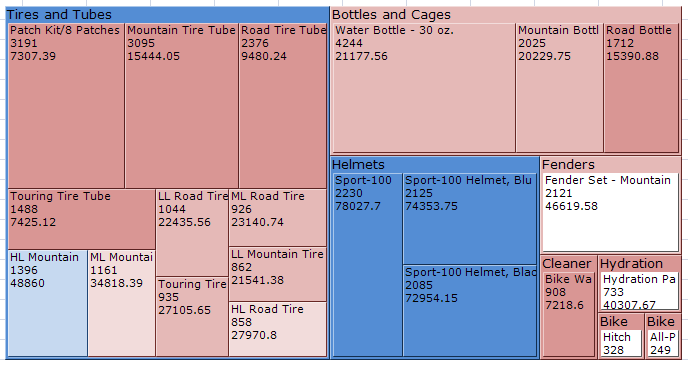 Advanced analytic capabilities and data visualisation of XLCubed. Formatting reports and dashboards is often more complicated than it seems. XLCubed makes it easy but utilising Excel's free canvas, meaning each element can be formatted properly, with precision, and even dynamically. 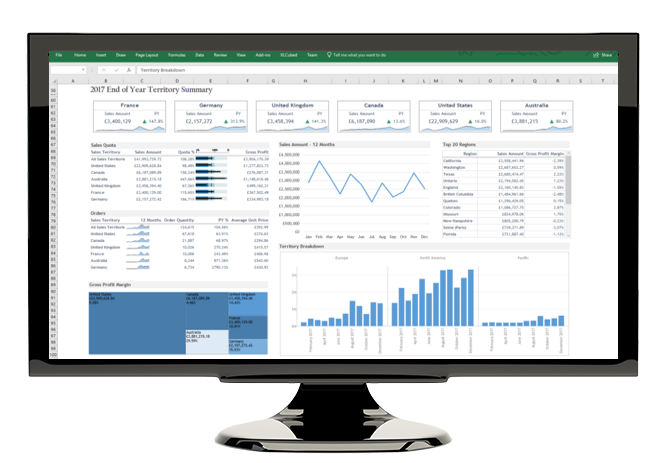 XLCubed also offers dynamic dashboards, meaning you can transform your static Excel workbook into a screen-responsive report to view on any device. See what XLCubed can do. Read our blog to get inspired.